Warning: Before you use your pressure cooker always read and follow the provided safety instructions. Improper usage of a pressure cooker may result in dangerous situations! A sterile technique is of utmost importance in mushroom home cultivation. A pressure cooker is a necessity within this process. A pressure cooker is needed to sterilize your substrates and casing material. Also, some supplies like scalpels can be sterilized in a pressure cooker. Or it is sterile or it is non-sterile, there is no in-between. If you have any doubts about the sterility consider it to be non-sterile. For a correct sterilization, the pressure within the cooker must be at 15 psi for a certain period. This means it will be about 121 °C within the cooker. No organism will stay alive during such a temperature. The duration of sterilization time depends a lot on the ingredients of the substrate and the volume of it. 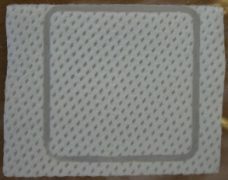 The specific sterilization time of specific substrates is mentioned in the techniques section. In a lot of books and other publications, there is referred to an autoclave when it comes to sterilization. An autoclave is actually nothing more than just a very expensive pressure cooker. Autoclaves are mostly used in hospitals and professional laboratories and cost thousands of euros. A pressure cooker does the same trick and is already available from 30-40 euro. 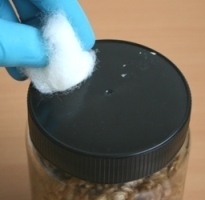 It’s best to use special filter bags, filter boxes and/or glass jars to sterilize your substrate in. If you decide to use something else always check that it can stand the high pressure and temperatures of a pressure cooker. The filter bags and filter boxes are specially made for mushroom cultivation and widely sold on the internet. They can be pressure cooked and contain a special filter which supplies the needed fresh air. Filter bags need to be closed with a good-quality impulse sealer. When you use filter boxes close the lid, before sterilizing, only for 75% and cover it with a double layer of tinfoil. The lids of these filter boxes close so hermetically that the boxes will deform when they are closed for 100% during sterilization. When the filter boxes come out of the cooker close the filter boxes immediately. You can also use standard glass jars. When using glass jars it’s wise to build in a filter yourself. Tyvek material is very well suited for this purpose. 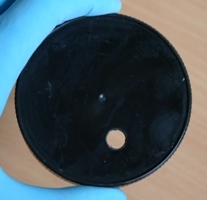 Punch a hole in the lid, place the filter disk under the lid and screw it tight. Also, the filter wool used for aquaria can be used very well. Make sure the wool is very tight within the whole of the lid. Finally, cover the jars with a double layer of tinfoil. – Inspect the articles, supplies, jars, and bags which you are going to sterilize. Check that they are clean and in a good, working condition. – Wrap all the articles and supplies in a double layer of tinfoil. 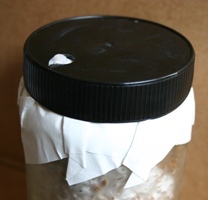 – Cover the jars and boxes with a double layer of tinfoil. – Jars with no holes in the lids and/or no filter whatsoever may never be closed for 100% airtight. The upbuilding pressure during sterilization is in that case not able to escape, which might lead to dangerous situations. – Keep an eye on the pressure cooker during sterilization. – And again: read and follow the safety instructions that come with the pressure cooker. When the cooker is closed and put on the stove it will start to build up steam. When the cooker has reached 15 psi, the right temperature has been reached and you can turn down the gas. Be aware that when you have to sterilize something for a certain period countdown starts from this moment, not from the moment you have put the pressure cooker on the gas. 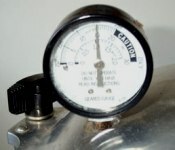 Some pressure cooke rs have a pressure meter and sometimes even a temperature meter. This will make it easy to reach the right pressure.Not all pressure cookers are this highly equipped. With most cookers, the correct pressure has been build up when there is continuously flowing out steam from the vent pipe. Not all pressure cookers are this highly equipped. With most cookers, the correct pressure has been build up when there is continuously flowing out steam from the vent pipe. Always take care that the articles, supplies, jars, boxes and/or filter bags are not directly on the bottom of the cooker, so place a rack on the bottom. Remember to fill the cooker with plentiful water so it will not dry out. Pasteurization is a little bit a different technique and is mostly used by the more experienced cultivators. It can be used for straw and straw/manure based substrates and for the preparation of casing material. Within any untreated material, there are a lot of (micro-)organisms. A part of these organisms is able and will try to destroy your hard work. But on the other hand, there are also a lot of organisms which stimulate the growth of mycelium and eventually the mushrooms very well. To make it easy we can just divide them into the good and the bad ones. When you pasteurize material it means that you heat this material at a temperature of 60-70 °C for a certain period. This temperature will kill all the bad organisms, while most of the good ones stay alive. Pasteurization for a lot of people is a difficult method to do correctly. When it’s not done properly the amount of potential contamination is very high and there is a big possibility all your hard work will be for nothing.